Cutaway of a French drain system installed on the outside of the concrete footing of a home foundation. A discharge line would also be included to send the water away from your home. 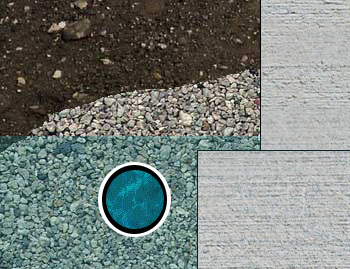 Shown in this photo are the French drain itself (filled with water), a fill of stone, and the backfilled soil. Many contractors will recommend installing a french drain system along the outside perimeter of your home to waterproof your basement. At B.Q. Basement Systems, we do not recommend this type of drainage system installed in your home. Instead, we suggest installing an interior basement drain along the inside perimeter of your basement or crawl space. For a free waterproofing quote in PA & NJ, call or e-mail us today! Found installed around a home - a clogged French drain system. A recipe for failure is placing French drain or any exterior footing drain along the outside perimeter of your home. With an exterior drainage system it will eventually clog with dirt, roots, and debris; even when it is placed in a bed of gravel. A drainage system several feet below the surface of the ground will only spell disaster. 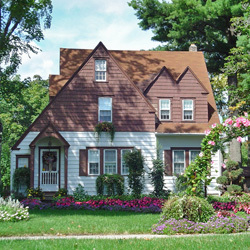 French drain systems have been installed on the outside of homes since the 1920s, and if they were the best way to dry a basement, B.Q. Basement Systems would be installing them, too. To help control clogs sometimes a contractor will try to stop this by laying down a layer of filter fabric around the drain. In this case, instead of the drain clogging, the filter fabric becomes blocked and won't let water into the pipe. Freezing pipes and sloped lines are other problems that are fairly common to occur to French drain systems. The water under your basement floor is usually not collected by this type of exterior drainage system. Then, in this case, you'll still need to purchase a sump pump for inside your basement. Some contractors even connect the exterior drains to the sump pump inside. Now that's sure to clog! 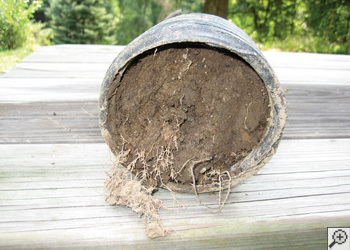 What happens when your drainage system clogs? It will need to be excavated and you'll have to start over. Who wants that? We service the Eastern PA and Western NJ areas, including Pottstown, Trenton, Levittown, Newtown, Frenchtown, Red Hill, Doylestown, Bala Cynwyd, Quakertown, New Hope, Flemington, and nearby.